Law to the Proud - Grace to the Humble | Preserving, Presenting and Preaching the Gospel of Jesus Christ. You have the right to FILM your work! Here is a site that gives you downloadable guide, because we have all heard people in public saying “Don’t take make picture” or “You can’t film me.” And there is of course the police officer that wants the camera shut off before he tells you the law. We all know, witnesses do LIE, lawyers have been known to LIE, judges have LIED, even police officers can LIE but a video does NOT LIE nor taint a story and is not bias. IT IS YOUR WITNESS WITHOUT PREJUDICE. The Photographer’s Right is a downloadable guide that is loosely based on the Bust Card and the Know Your Rights pamphlet that used to be available on the ACLU website. It may be downloaded and printed out using Adobe Acrobat Reader. You may make copies and carry them your wallet, pocket, or camera bag to give you quick access to your rights and obligations concerning confrontations over photography. You may distribute the guide to others, provided that such distribution is not done for commercial gain and credit is given to the author. The right to take photographs in the United States is being challenged more than ever. People are being stopped, harassed, and even intimidated into handing over their personal property simply because they were taking photographs of subjects that made other people uncomfortable. Recent examples have included photographing industrial plants, bridges, buildings, trains, and bus stations. For the most part, attempts to restrict photography are based on misguided fears about the supposed dangers that unrestricted photography presents to society. Ironically, unrestricted photography by private citizens has played an integral role in protecting the freedom, security, and well-being of all Americans. Photography in the United States has an established history of contributing to improvements in civil rights, curbing abusive child labor practices, and providing important information to crime investigators. Photography has not contributed to a decline in public safety or economic vitality in the United States. When people think back on the acts of domestic terrorism that have occurred over the last twenty years, none have depended on or even involved photography. Restrictions on photography would not have prevented any of these acts. Furthermore, the increase in people carrying small digital and cell phone cameras has resulted in the prevention of crimes and the apprehension of criminals. As the flyer states, there are not very many legal restrictions on what can be photographed when in public view. Most attempts at restricting photography are done by lower-level security and law enforcement officials acting way beyond their authority. 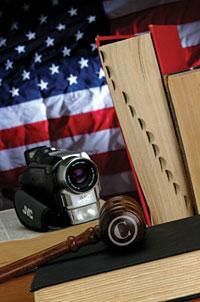 Note that neither the Patriot Act nor the Homeland Security Act have any provisions that restrict photography. Similarly, some businesses have a history of abusing the rights of photographers under the guise of protecting their trade secrets. These claims are almost always meritless because entities are required to keep trade secrets from public view if they want to protect them. More information about photography law in the United States can be found in the Legal Handbook for Photographers-The Rights and Liabilities of Making Images.